This Mac photo recovery software tool lets you recover all your lost, deleted, formatted and inaccessible photos, videos and music files from your Mac or other storage device. It provides complete photo recovery from any Mac-based hard drive, iPod, USB drive, external hard drive, digital camera and other storage media. 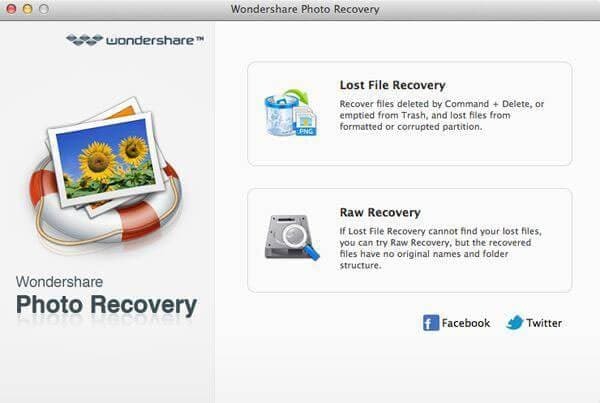 With an easy-to-use interface, even novice users canrecover photos on Mac with great ease with just a few mouse clicks. • Recover not only images, but also video and audio files. 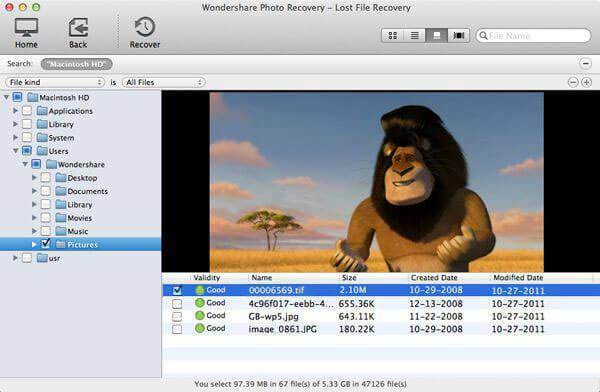 • Recover photos from Mac and storage media such as USB drive, flash card, digital camera, hard drive, iPod, etc. 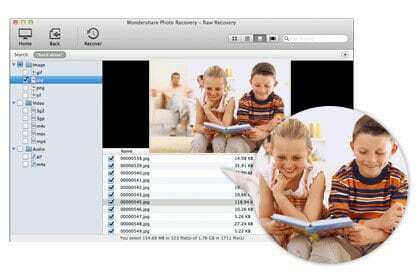 Most photo recovery software Mac currently on the market can restore photos from media storage only . • 2 special designed Mac photo recovery modes- Deleted Recovery and Deep Recovery have enhanced the recovery experience on Mac. 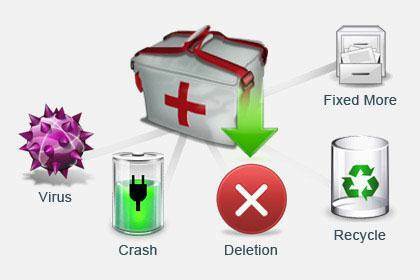 • Most data loss scenarios are covered Recover photos lost because of intentional or accidental deletion, improper device usage, formatting, virus infection, software crash, and other reasons. • Preview of images and camera RAW files before recovery lets you evaluate recovery quality in advance. • Provide real-time and direct scan results by displaying the recoverable photos during the scan process to let you stop the scan once the target photos are found. 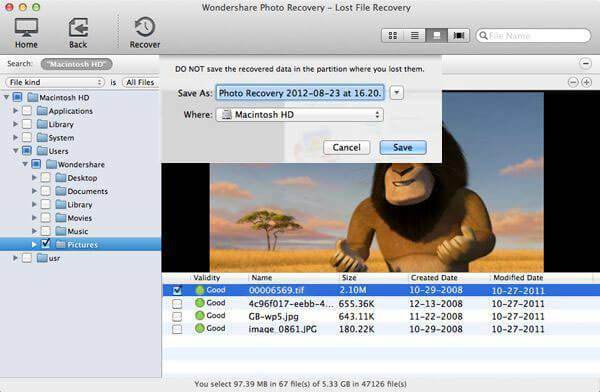 • Recover deleted photos from Mac with original file names, shooting dates, and storage paths. • Precisely search your recovery results for the specific file names you need. 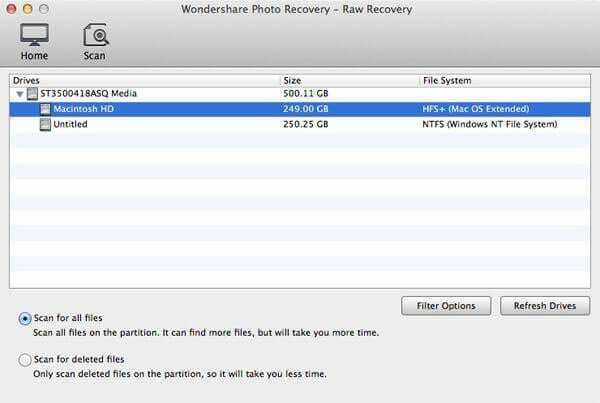 Recover photos on Mac within only 3 simple steps, just as easy as 1-2-3. No recovery skills needed. This Mac photo recovery software tool lets you recover all your lost, deleted, formatted and inaccessible photos, video and music files from your Mac or other storage device. 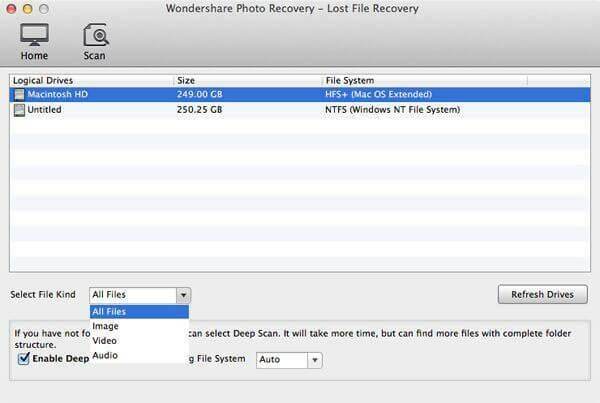 Easy-to-use and user-friendly interfaces let you recover photos on Mac at a great ease. Next, let’s check how to use this software to recover lost media content in a few clicks. Launch the program and you’ll get the interface below. There are two recovery modes for your option: Lost File Recovery and Raw Recovery. After entering the Lost File Recovery/Raw Recovery, choose the disk or partition where you lost your files and click "Scan" to find lost data. If you want to find lost data as many as you can, you can enable the “Deep Scan” at the bottom. Also you can use the “Select File Kind”/“Filter Option” to refine the scan result, if you have target file type to find. Note: In the process of scan, if you have already found the photos that you need, you can click "Stop" button to stop the scanning, and go direct to the next step. For Lost File Recovery, if you remember the file name, you can search the file by its name to find the target photos precisely in a short time. For Raw Recovery, you can sort the file list according to size and date. Caution: The scan results are temporary in memory. If you click "Home", the scan results will be lost. Select or enter a directory to save the photos, videos and music files that you need. For Lost File Recovery, you can recover with original directory. Also you can enter a new entry by yourself. Note: We highly suggest that you should select a directory that is located in a different partition from the source partition.